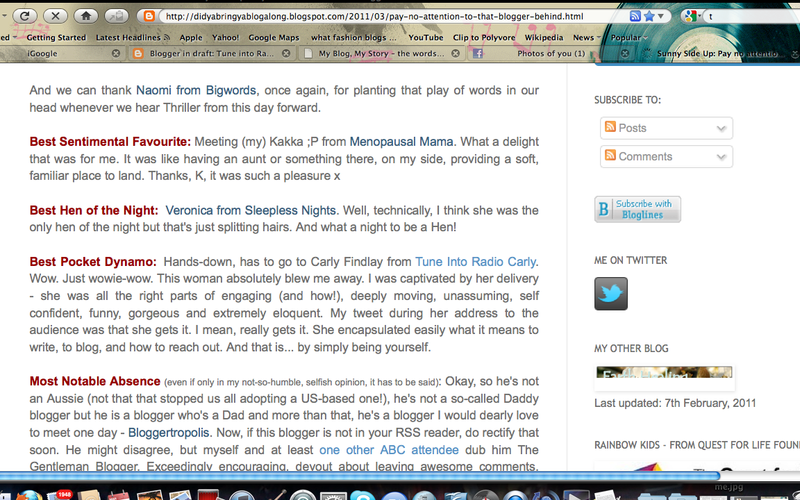 Tune into Radio Carly: Aussie Bloggers Conference. Perfect day 2: New friends. Heartfelt stories. So much love. Aussie Bloggers Conference. Perfect day 2: New friends. Heartfelt stories. So much love. The Aussie Bloggers Conference. Wow. So many attendees have already written about their experiences. I was going to write an epic post earlier, but unfortunately I've been so tired this week, and fell sick. So you can read the epic posts and elaborations of the speaking panels in the link I've provided above. Words alone can't express how excited and passionate (and thankful) the conference made me feel. I loved it. So. Very. Much. The conference was held on Saturday 19 March in Sydney. Around 170 bloggers, advertisers and media reps attended. I wish it was over two days because I wanted more discussions about blogging, and more time to get to meet and know people. To be honest, I was worried about going - worried there'd be cliques. I talk to everyone, but in the back of my mind I feared it'd be like highschool. I don't have a blogging circle, and I didn't 'know' more than about five bloggers attending the conference. But I am relieved to say that the conference was filled with nice, kind hearted, inclusive and caring people. If you want your confidence to be boosted, I recommend attending a blogging conference. Good content is key - we can pretty up our blogs a lot, but readers come back for the content. Twitter is best the marketing tool to use - and not just to promote your blogs. Interact with your followers, engage in conversation, and this will help draw people to your blogs. Be careful online. Don't post pictures of children. Don't tell other peoples' stories. Blogging creates wonderful communities and friendships. It's a little like online activism. There was a lot of tweeting through the conference. To some (me included) this may have been considered as rude, but it was also a good way to get instant messages from the conference recorded and out there. I did partake in tweeting, especially about the attractiveness of a certain male panelist. I didn't get as much out of the panels as I got out of the personal story readings. I think if the next event is over two days, it'd be good to have some more practical workshops - how to promote blogs, how to write a certain style etc. The personal stories blew me away. 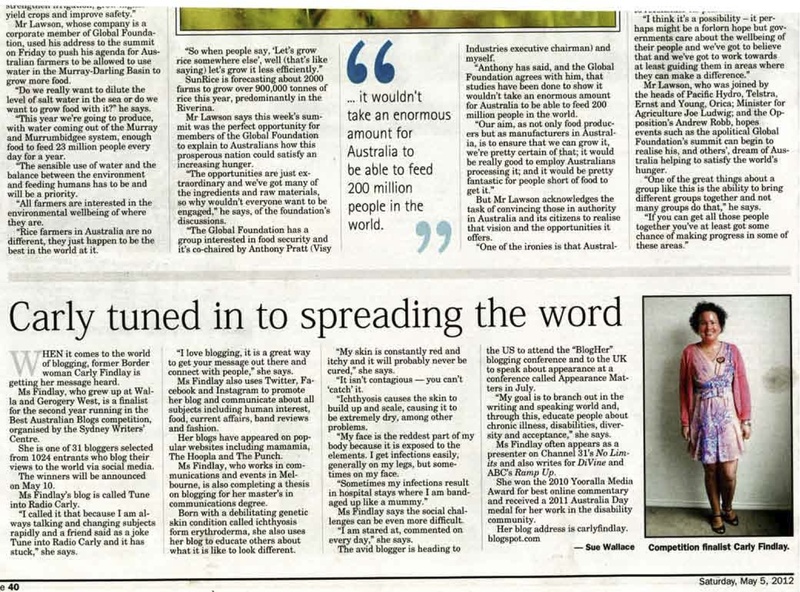 I was asked to speak in the My Blog My Story feature. Thanks to Nicole Avery for recommending me. It was an honour to speak alongside five inspirational, strong and courageous women: Tiffany Tregenza - My Three Ring Circus, Kelley - Magneto Bold Too!, Kim Foale - Frog Ponds Rock, Lori - Random Ramblings of a SAHM and Karen Andrews - Miscellaneous Mum. Their stories were very moving. Everyone who spoke showed strength through adversity. They've experienced hard times. Kim and Karen have posted their stories on their blogs so you can read them for yourselves. My speech was about the way my blog has afforded me so many opportunities. I did it off the cuff, but read out two blog posts: When my face is this sore I find it hard to look in the mirror, and the DiVine version of In control telling my story. The off the cuff bits covered what I do in my life, what my illness is, what support my blog has brought, how I have helped others, my achievements since blogging, and giving out my room number to any men in the room. And I spat my lolly out on stage! Keeping it real! Thanks to Kim from All Consuming for recording this, sorry for the sound. You will need the volume up high. I received so much good feedback. Four big claps, lots of laughs, some tears, and so many people came up to me to thank me for my speech. It was a honour. I felt very loved. 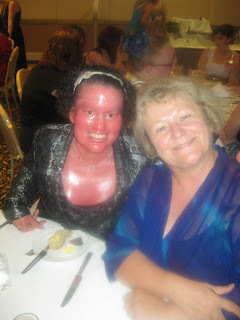 @carlyfindlay Oh you are...you were/are fantastic! 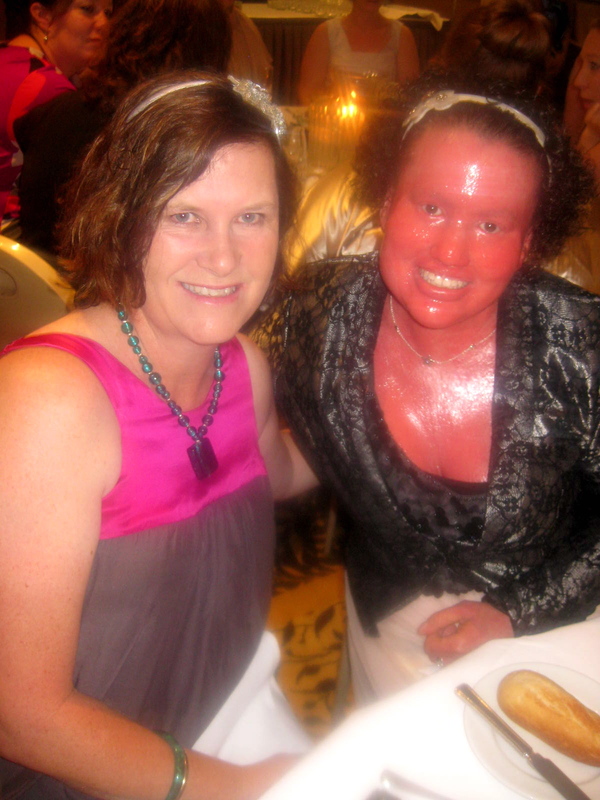 You know what @carlyfindlay? People ARE stupid. 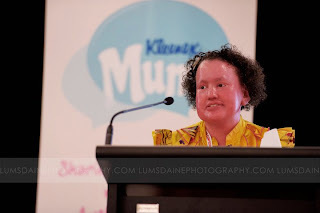 @carlyfindlay is speaking now. Amazing. Thank you tweeters, if I haven't thanked you via Twitter already. I loved the Crowdsourced Keynote feature too - bloggers reading their blog entries: The NDM - Not Drowning, Mothering, Bern Morley - So Now What?, Jodie Ansted - Mummy Mayhem, Kristin Brumm - Wanderlust, Kim Berry - Allconsuming, Mark Mullins - Blak and Black and Eden Riley - Edenland. So much honesty, raw detail, confronting topics, interesting stories and humour in the My Blog My Story and Crowdsourced Keynote features. It's this sharing of life experience which resonates with me and makes me want to blog and read blogs. I met some wonderful new friends. And found wonderful new blogs. I got to know all the speakers in My Blog My Story who sat at my table, plus Veronica Foale from Sleepless Nights. And I chatted with Veronica and Kim Foale, plus Magneto Bold Too at the airport on Sunday. I FINALLY met the gorgeous, stylish and so very nice Bern Morley. She's so tall! And also wrote some lovely words about meeting me. Meeting Bern was a blog idol moment. I was seriously excited. I also met Rick Morton, blogger and Mama Mia staffer, who I tweeted across the room for his attention. I enjoyed speaking with Del from Relish, My Relish - looking forward to catching up in our 'hood, and Eden and Beth from Baby Mac during the breaks. I met a really nice Queensland journalist at lunch too - but I can't recall her name, sorry - I hope she reads this and reminds me. 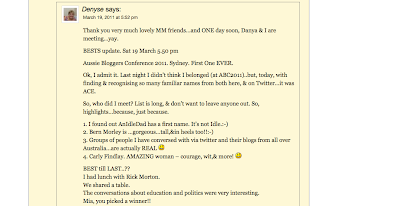 Edit - she commented, and revealed herself as Belinda from Save Mum Sanity. And I was so lucky to win some Moet and Chandon. After the conference was the ball. Hello princess skirt, sparkly shoes and unlimited champagne!!!! Dinner was good. Caesar salad, fish and risotto, and strudel. The ball allowed me to meet lots more people. I met Corinne and Ann Paterson - lovely ladies. Corrinne kept me entertained with her tweets during the conference. One of my favourite people I met at the conference was Michelle from Farmer's Wifey. She was so nice, funny, and immediately made me feel welcome. And I loved her dress. Bern took these. I was a bit tipsy. And this is me, a bit star struck again with Bern. 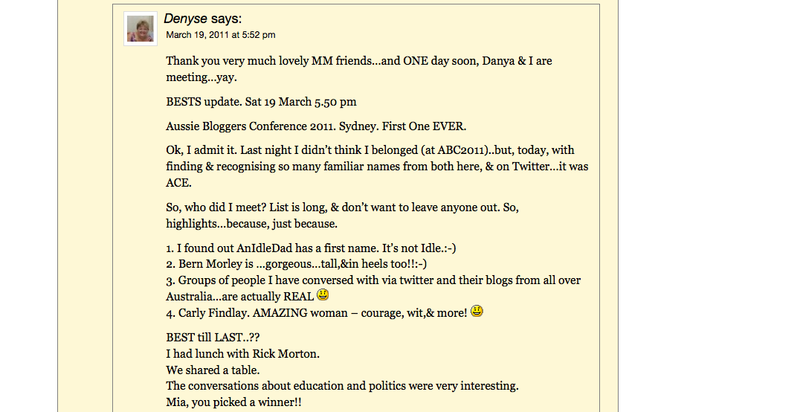 Lori from Random ramblings of a stay at home mum was also so sweet. River, Bern, me, Lori and Rick. I spoke for ages with Suzanne from Aussie Writers - she was great to talk to and we have a few things in common. Back off the dancefloor I chatted with Fox in Flats, Kelly from Be a fun mum, Jayne and Sarah, and Bern took this upside down photo. And I ate chocolate out of a wine glass. And laughed with Idle Dad. Such a wonderful day and night. And to everyone who made me feel special - thank you from the bottom of my heart ♥ We can be friends for life. I had so much fun meeting you. You really are so much fun and seriously, I don't know where you keep your energy, but I want some! want to make a person feel good on a cold Saturday...well you knew how! Such a warmly written post...by a person with much warmth & charm. 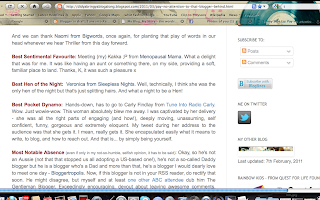 Two mentions...I feel rock star like now...LOL. www.memoriesbydenyse.com for some other ABC blog posts. I find it ironic that we caught a plane out of Sydney together after our little 'discussion' about your terrible taste in music. Great wrap up post Carly. As I was moderating the other session I didn't get to hear your My Blog, My Story, but I heard nothing but rave reviews. Thanks for all the energy and positiveness - you are an inspiration! Oh I completely loved meeting you too you bloody pocket rocket. I knew you'd have the personality that melts walls away, but I didn't expect for you to be just so, I guess, like me. Just easy to talk to and someone who would have been my friend had we grown up together. Guess that's why we became friends online. I was so freaking hungover that I only wish I was in better form this time last week. In fact, it makes me sad it was a week ago. Hey there 'neighbour', it was great to meet you. See you around soon, perhaps you can give me some of your energy! Was great to hear your story, to have a chat at the dinner and to dance the night away with you. I love Cold Chisel too, and I envied you your princess skirt and sparkly shoes all night! See you next year in Melbourne? Hi Carly, it's me the nice Qld journo you had lunch with! Loved your wrap up and really enjoyed meeting you. Lets do it all again next year. What an amazing experience! It sounds as though you've met some amazing people and made a real impact on many others. This post is THE BEST. Your enthusiasm Carly, your energy, just shines through SO MUCH. I met you in the lobby on Friday afternoon - and you blew me away with that infectious energy. IRL or URL, that energy you have is electric. You have such an awesome, amazing sprit. Thank you so much for writing this blog and inspiring myself and others. It's people like you with your positive energy that make the rest of us want to be better. Congrats on your warm reception at the confrence. You deserve all of the postive feedback you've recieved. I am so glad we met. So many people to see and so little time to chat with everyone. I agree with you. All a whirl really. Happy you had giggle at my tweets. Haha bogan rock, that's awesome. Your skirt is SO beautiful! Glad to see you took it out on the dance floor. There is currently loud construction work outside my window (shhhhhh, dammit!!) so I can't hear your speech. But it seems you got a wonderful reception though, of which I am not at all surprised. It truly sounds like a fabulous day - indeed perfect! Ah, this takes me back. What a wonderful day it was! Giveaway - Able and Game, Curly Pops and more! Cows with guns - the milk wars.